Following this previous post we moved our primary key off the harddrive onto an encrypted USB flash drive for safe keeping. Occasionally we need to use our primary key, for instance to sign other people's public key. So how do we bring our primary key back "online"? The method described in this post connects the encrypted USB drive containing the primary key with our day-to-day machine. This is a compromise of security for convenience because we expose the primary key to whatever malware may have accumulated on the day-to-day machine. The alternative of booting a Live CD is more secure but very cumbersome. 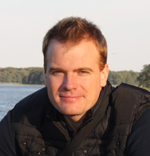 To demonstrate the use of the primary key stored on the USB drive, we are going to download and sign a public key belonging to Søren Poulsen. First set a keyserver in the ~/.gnupg/gpg.conf file. Now let's find the key we want to sign. 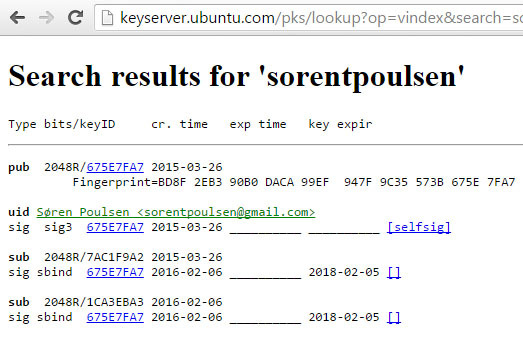 Open http://keyserver.ubuntu.com in a browser and search for a person named sorentpoulsen (or any other person who's key you want to sign). Insert the encrypted USB key with the GnuPG backup. I'm going to assume the backup folder is now available under /media/myusb/gnupg. 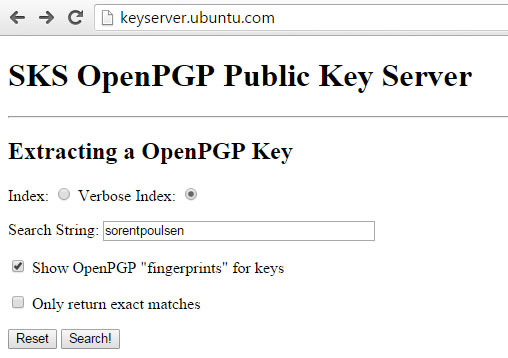 Update Søren Poulsen's key on the key server. Skip this last step when you are just testing.